A Must Have For Travel OR Trial! 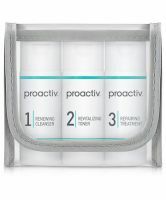 If you are a user of the Proactiv 3 Step System, you must have this! This is the incredible power of Proaciv in a set that will work for airline travel. When these run out, I just refill the bottles with product from my larger bottles. It is extremely convenient! For those of you with teenage or adult acne that haven't ever tried, or have tried, but years ago, this is the perfect trial size. ...read moreFor those of you who have tried it, but didn't like it, you should try it again, now! Proactiv changed the formulation a little while ago, and it is more effective. I am 37 years old with adult acne, and my 2 teenagers have teenage acne and we all use this 3 step system. We all have positive results when we are consistent! For me, I am very consistent, so I have control over my acne, except for the occasional single breakout. I will say if I miss a day, I will have a breakout. Your pimples are under the skin, preparing to make their appearance. When you first start Proactiv, you will break out! All of the impurities in your skin will come out but, it will clear up within 30 days or so. My 2 teenagers are not as consistent, so they do usually have some acne, but it is on the milder side. Like I said, this the perfect travel and/or trial size so pick one up! The only reason I did not give this 10 stars is the benzoyl peroxide in the repairing lotion will stain your clothes, pillowcases, and washcloths. I just switched to color fast bedding and hand towels. As far as your clothing goes, I make sure I am in my pajamas before I wash my face because I am not worried about those. You can also wear a towel under your arms and change after. This is not a big enough problem for me to give up clear skin! It does a great job getting rid of the acne. If you have alot of acne on your face then the 2nd step may sting for a few minutes but not bad. The only complaint I have is that it takes a little while to do. Its not very fast.